Now that the GEMSTRA Initial Exchange Offering is LIVE on Cobinhood, it’s important to review the different Bonus Levels so our participants know exactly how much GEMS they will receive for a purchase. First Mover Bonuses: A competition to be the first to participate in each level of the IEO. Final IEO Group Bonuses: A uniform bonus awarded to everyone based on the total amount of ETH raised in the IEO. We have incentivized the entire token sale process to make ANY time a good time to participate. For example, at the current stage of the IEO, the Top 10 purchasers of the first 20 will share a First Mover Bonus Pool of 30 ETH in tokens! In addition to this First Mover Bonus Pool, all participants will receive the Final IEO Group Bonus (up to 36%!). NOTE: The Final IEO Group Bonus will continue to build for everyone as more ETH is raised, so it won’t affect your bonus based on when your decide to participate in the IEO. Participate now and you Final IEO Group Bonus will continue to grow. After the current First Mover Bonus Pool is given away, ANOTHER First Mover Bonus Pool will kick in, and once again, the top 10 purchasers of the first 20 at that level will share this Bonus Pool, this time worth 40 ETH in tokens! Your chances of winning the First Mover Bonus Pools are theoretically better in the beginning due to less competition, and the Final IEO Group Bonus will be the same for everyone… so if you are considering participating, NOW is as good of a time as any! Everyone will benefit from this new updated structure! 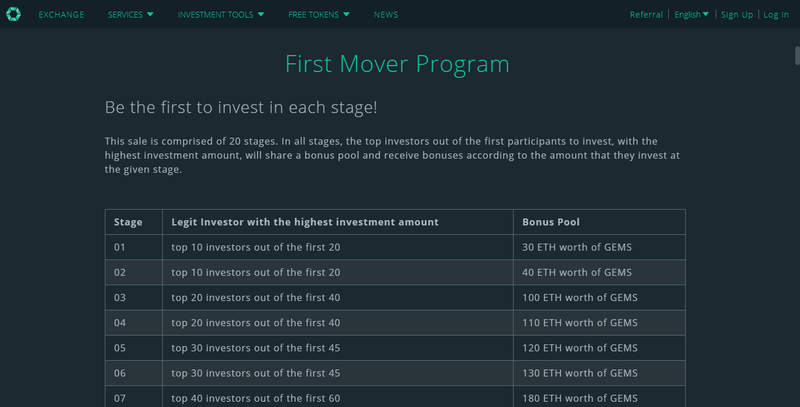 As the Initial Exchange Offering fires up and competition becomes more fierce, remember there will be a total of 20 more First Mover Bonus Pools to the early purchasers/first movers! These First Mover Bonus Pools represent a massive amount of GEMS, so don’t miss your chance to become a First Mover WINNER today! Ambassador Bonus Pools: A chance to win our multiple Ambassador Bonus Pools for being the Top Referrer. You can locate your referral link once you are logged in to Cobinhood at the Official Token Sale site. Start sharing the link RIGHT AWAY on your social media so you can get the most referrals!